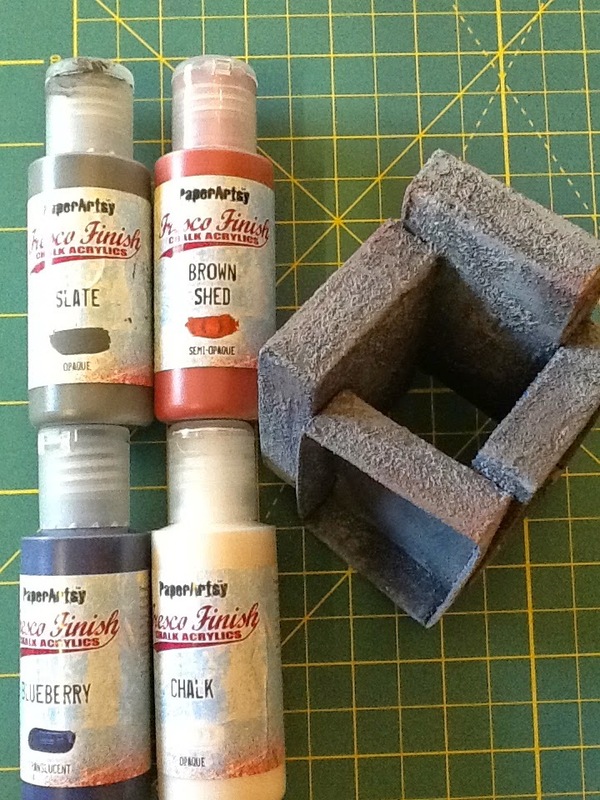 Hi everyone Alison (Craftytrog) here, joining you this evening with a post about using Fresco Finish Paints to make paint sprays. I love making backgrounds, spraying with watered down paint, and creating lots of lovely drips. My background was inspired by a circular panel on the set of my favourite quiz show, QI...the one behind Stephen Fry :-) I thought that the lovely new Lynne Perrella ladies would look perfect in this setting. Step One: My base is a sheet of Heavy Grey/White Board, measuring 5x7 inches. 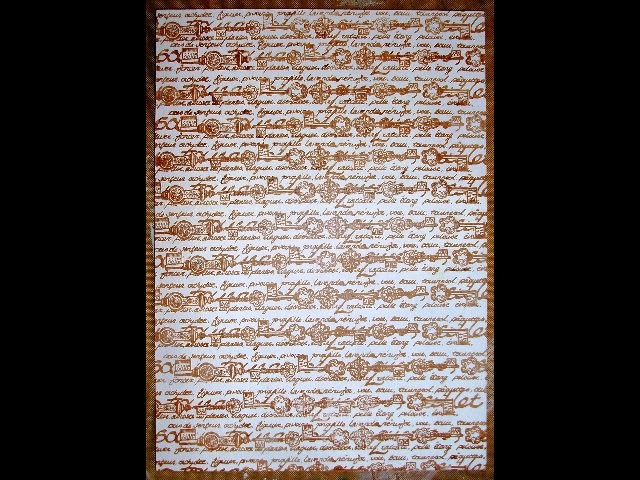 I gave the board a base coat of Snowflake Fresco Finish Paint, then I used Ranger Archival Ink in Coffee to repeatedly stamp the text and keys border from LPC032, all over the board. Step Two: I took a couple of Small Spray Bottles, filled each bottle halfway with water, then added Yellow Submarine Fresco Paint to one, and Autumn Fire Fresco Paint to the other. The amount of paint I added came about halfway up to the level of the water. I shook the bottles well, and first sprayed the Yellow Submarine as a base, then sprayed the Autumn Fire, holding the board vertical to get some lovely drips. I added a little Brown Shed Fresco Paint to the Autumn Fire bottle, to create a darker shade, then spritzed this to the top of the board, then holding it vertical to get more drips. Step Three: Next, I base-coated three little Tando frames with Brown Shed Fresco Paint. 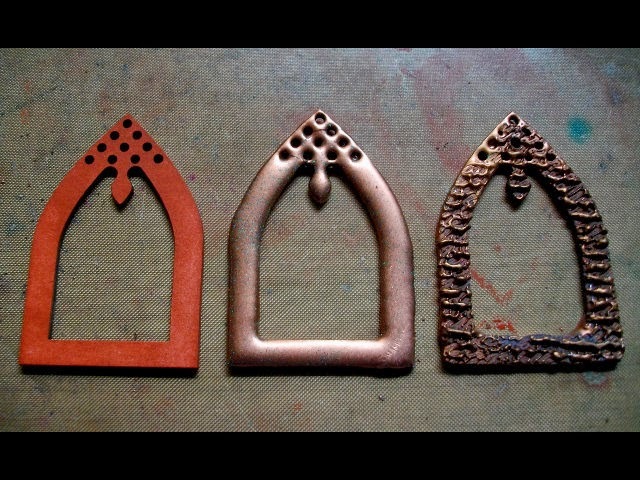 I then embossed them with some Frantage Aged Copper embossing powder. I repeated this step a couple more times, then whilst the final layer was still molten, I inked up the script from the Ink & the Dog Backgrounds - Plate 6 with Versamark Embossing Ink, and stamped into the molten EP. I added some Spanish Topaz Treasure Gold highlights to the embossing. Below you can see the three stages. Step Four: I mixed some Haystack and Vanilla Fresco Paint together, then painted a piece of Smoothy Stamping Card with it. 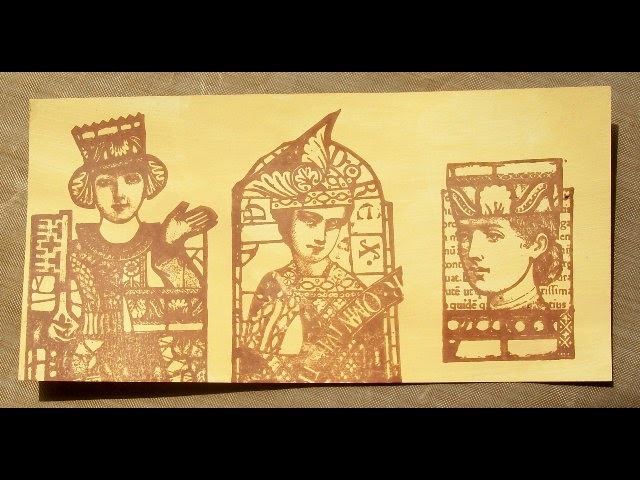 Using Coffee Archival Ink, I stamped the head & shoulders of the two ladies from LPC032, and one of the small images from LPC034. Step Five: I cut the images out, and glued them behind the frames. I sprayed a little of the orange paint mix onto my Craft Mat, then added some colour to the ladies' faces with a paint brush. I later decided to add a little watered down Bora Bora Fresco Paint to their crowns, as a contrast colour. Step Six: I added some Aged Copper embossing powder to the edges of my board, and also sprinkled a little over my background. I embossed some little metal corners, rubbed some Spanish Topaz Treasure Gold over them, and glued these to the four corners of the board. Finally, I glued my framed ladies to the background, adding some metal keys to finish. 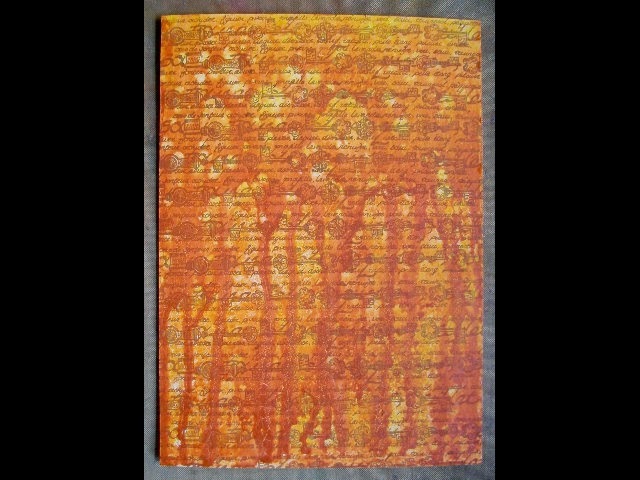 I really love how my drippy background turned out, it was just the effect I was going for. And, stamping into embossing never fails to delight me. I hope I have inspired you to mix up some water and Fresco Paint, and make some drippy backgrounds of your own for the 'Sprays' Challenge. Please link up to the Challenge, as I'd love to come and see how I've inspired you. We would love you to join in with challenge #8: Sprays If you are inspired by any of our guests who blog with us over the fortnight, then please join in and link up your creativity HERE. 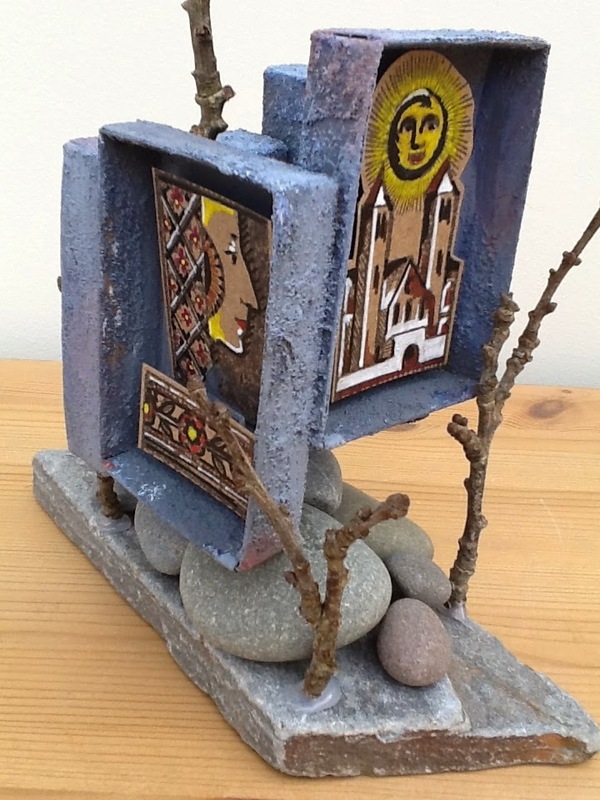 All links go in the draw to win a voucher to spend on products of your choice from the PaperArtsy online store. The Sprays link will close 17:00 (London Time) Sunday, May 10th, winner will be announced 2 hours later at 19:00. Hello everyone. Kate here, joinging you this evening with a post on sprays. 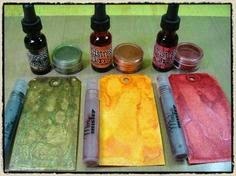 Sprays are so versatile and are a quick medium to develop color as well as texture. My favorite thing to make with sprays is drips. 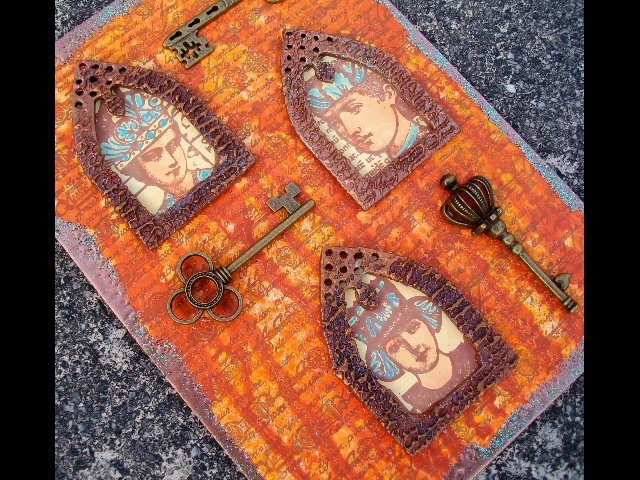 I am sharing a journal page with sprays used in my background as well as on my embellishment. Step one: I started off by gluing various size paper strips to my background. I added a light coat of gesso with a palette knife and then waited for the gesso to dry before adding a few stickers to my background. I chose a light colored spray and sprayed it on my background, being careful not to cover up all the white space. I tilted my page up after spraying to allow the ink to drip down the page. Step Two: I let the lighter color spray dry before spraying in a darker colored ink; otherwise the colors will mix to make the color of mud. Step Three: Using a flower stamp, I stamped with brown ink in the background and some script in blue ink. Stamping in a random pattern is important. Backgrounds do not look good if they are uniform. Step Four: To create my embellishments, I sprayed various colored inks onto a piece of white cardstock. I them stamped my image from ELB16 over top and cut it out. Step Five: I repeated step 4 several times. I ended up choosing a different color to complete the rest of the flowers. The lighter colors looked better against the background. I glued the flowers together to make one large flower and added a button in the center. Step Six: Lastly, the page was completed by placing the little girl and the kite next to my focal point, the flower. A little doodling around the edge of the page makes a nice frame. I hope you will give sprays a try if you haven’t. 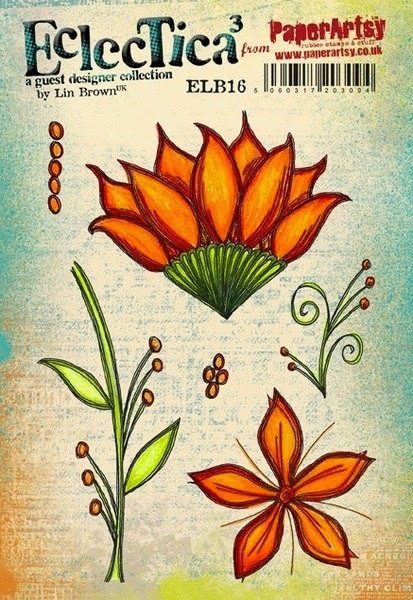 Don’t you just love how they can create the perfect background for your stamped embellishments? I have to admit, in the middle of this project I set it aside because I couldn’t find the right placement for the flower. The whole page was not sitting right with me. After starting a card I was still not satisfied with the outcome so I came back to the journal page. I changed the photograph I was working with and the position of the flower and that’s when it all came together. Sometimes you have to just set a project aside and start again later. Whether it's full coverage, a light misitng or splats/drips, sprays are so much fun to work with as you have demonstrated perfectly Kate. By simply layering the colours and the use of bold colours for the focal piece, this is a delightful journal composition. Thanks for sharing your creativity with us all. It feels like years have passed since I last spoke to you, but it was only a few short weeks. Our manic period has finally come to an end. We are enjoying life settling back into normality after a very busy first quarter kick off to 2015. It's now time to add lots of new things to the website over the next few weeks, and plan for the upcoming shows at Port Sunlight (Happy Stampers) and the Doncaster Dome (Stamp Magic). We also have 3 groups of friends and family coming to visit from New Zealand in the near future (exciting), the munchkins x 2 are into exam mode for 6th form (scary), Miss almost-21 is submitting her year end uni projects, and Master H is also doing his Year 11 end of year exams. Before we know it summer will be here and it feels to us like the year has only just started! I am very excited about this next topic. numerous brands of sprays have been utilised in many different ways in my creative life for several years. Be they non-permanent, permanent, with a bit of sparkle, or not there are so many things you can use them for. BUT, as the video will show you, add paint into the equation, and you have a whole new baby to start exploring! Hi everyone, Darcy here. Another great topic comes to an end, and again we have been wowed with your ideas. it never ceases to amaze us how you take the theme and run with it, producing some fabulous projects. To claim your £50 voucher, please email me, Darcy with your details to darcydotneedles@hotmail.com and I'll explain how you claim your prize. Thanks Darcy for drawing the prize winner, and well done to our latest winner Kristiina. 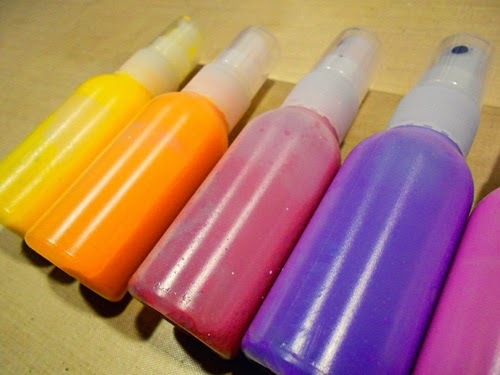 He also showed us how to use ink pad re-inkers and mica powders to make your own sparkly sprays. I love to make new colours this way, but i find you sometimes have to watch how much mica you add, and how grainy it is...to much and or too-chunky particles can clog your spray nozzle making it harder to use. 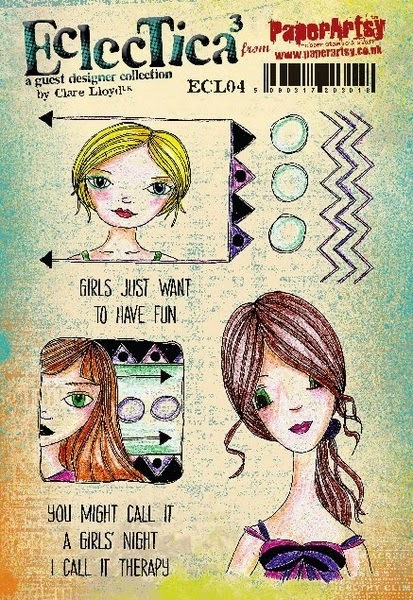 Add stencils into the mix, and you can have good and bad times. Yes its a lot of fun to layer, but remember that ink is translucent when making decisions about colour; some colors don't look so good on top of others, and sometimes they look fabulous. 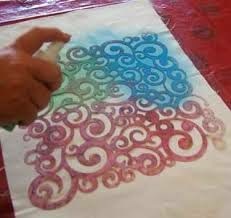 You may have to consider drying a layer before adding the next, or you may wish 2 colours to mix and blend to create a new colour. Also bear in mind that some inks are reactivated when they get wet, this can also affect outcomes in good and not so good ways! You need to work these features to your advantage. Also think about the surface you are working on. Lots of water is going to buckle paper immediately as it is wet on one side and not the other, this can make life tricky when trying to use stencils. Consider sealing both sides of your surface with gesso, but bear in mid this will affect the absorbency of the surface, and dyes do like a porous surface to sink into. 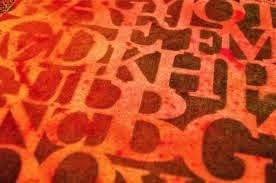 Fabric can be a good solution, as it won't buckle, and stays nice and flat when working with stencils. 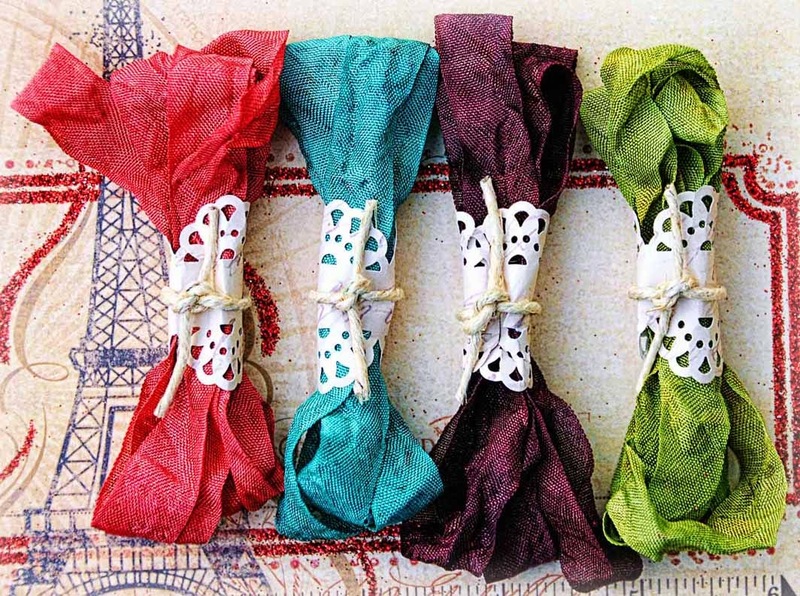 Of course, using your dye sprays to tint ribbons is fun too, and a great way to get the perfect colour ribbon to match your project. 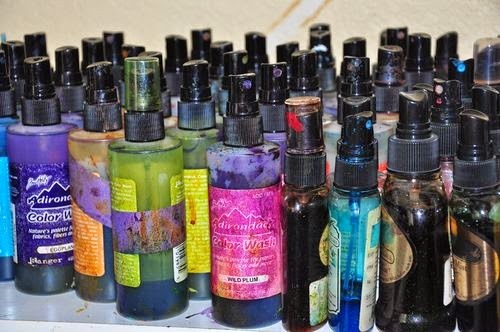 And lets not forget about making paint into sprays. This offers you control over the opacity of your spray, and a paint spray can provide similar effects as dye inks, but it will always be a permanent option once dry. A white paint spray is very exciting, and you simply vary the opacity by how much paint you add to the water. You can then also tint the white mixture with reinkers, other colours of paint or even powdered pigments, grated crayons or pastels, mica powders etc. So there you have it, just a few starting pointers, but I know you guys adore your sprays for journalling, mixed media and lots of other applications, so I really hope you get a chance to play along this week, and show us your preferred techniques. This is such a broad topic, I can't wait to see what you do too! I know our designers have got awesome things lined up to share! We would love you to join in with the 2 week challenge for Topic 8:Sprays. Feel free to join in and share your ideas and link up your creativity to this page. The whole concept of this challenge is 'play along with us'. 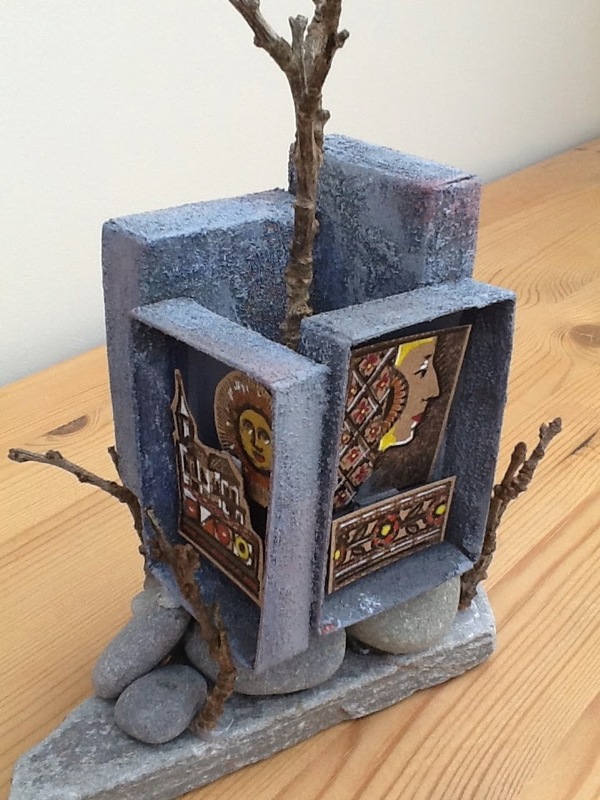 You are encouraged to put your own twist on ideas you see on our blog. We love to see how you are inspired! 2. The link you put on our linky page must lead directly to the specific post on your blog where you have explored the technique/ idea mentioned in point 1 above. Don't link to the home page of your blog, or we will be unable to find the post to leave you comments. 3. Spam links will be deleted. 4. We prefer your challenge post is created exclusive to our challenge, but if our topic fits perfectly with another challenge, then of course your post may link to both if you feel it is appropriate. 5. You are most welcome to use stamps/ products/ substrates you have to hand from a variety of companies, we do not expect you to exclusively use PA products - it's lovely when you do though! Step One: Whenever I create an Art Doll, I always start off with a sketch so I know where I'm heading. In this case, I stamped the face (Eclectica Clare Lloyd 04), then sketched in the rest roughly. Step Two: As she is to be a free standing clay doll, I made an armature from wire. This does not need to be perfect, it's just a rough shape upon which the clay can be added. Step Three: I've now added the clay to the shape. This may look like a heavy solid lump of clay but it's not! I used air dry Hearty clay, which is very light and has a spongy feel once dried out. As you might notice, I decided to chop off one of the wire legs from the armature, it was much easier to shape my dolls legs around one strand of wire! Step Four: No, I haven't forgotten this project is all about niches! The niche in my Doll holds her sparkly heart, and to create it we need to 'cut out' the shape. I've used a cookie cutter for this, it works perfectly through the soft clay. Step Five: As you can see, we are now left with a perfectly circular hole in the body of the doll. 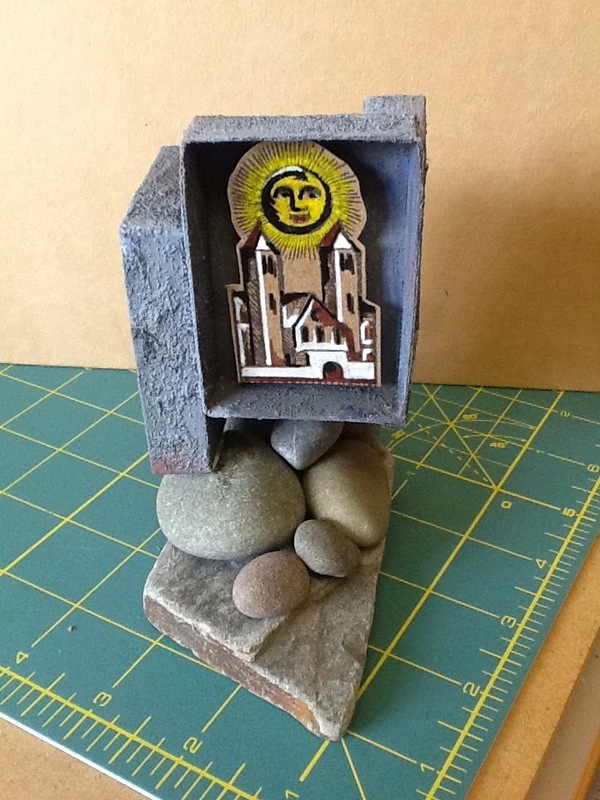 This hole will have a back added to it to form the niche, this is done simply by gluing a decorated piece of card across the back. Step Six: Once the clay has fully dried out, it can be decorated! I painted the dress with Blue Oyster paint, then added stamped tissue over the top to give the dotty effect. 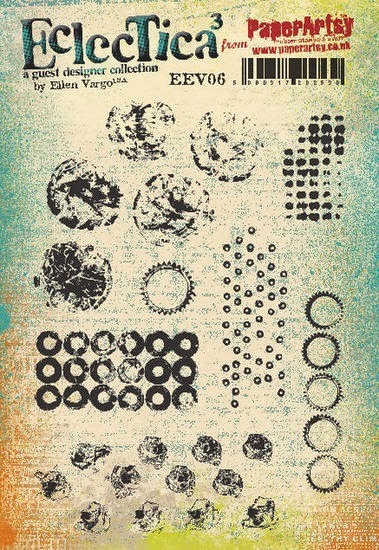 The dots are from the Eclectica Ellen Vargo 06 plate. The glue used to attach the tissue gives the doll a nice glossy sheen, a look I followed through with the rest of the doll. 'Happy Clare' was then finished off with bunting, before adding the stamped and coloured face. I emphasized the edge of the niche with doodled circles, before placing in her red sparkly heart! I just love all of the faces Clare has created, and I'm in the middle of creating a doll for each of them. It's funny how the dolls seem to develop their own quirky personalities as you create them, you will never manage to create two the same! As you can see, adding a niche to this kind of project isn't difficult, and I think a niche just adds that extra detail that will make your art stand out. Why not have a go, I would love to see! Thank you so much for having me, I've loved sharing 'Happy Clare' with you today! We would love you to join in with challenge #7: Niches If you are inspired by any of our guests who blog with us over the fortnight, then please join in and link up your creativity HERE. 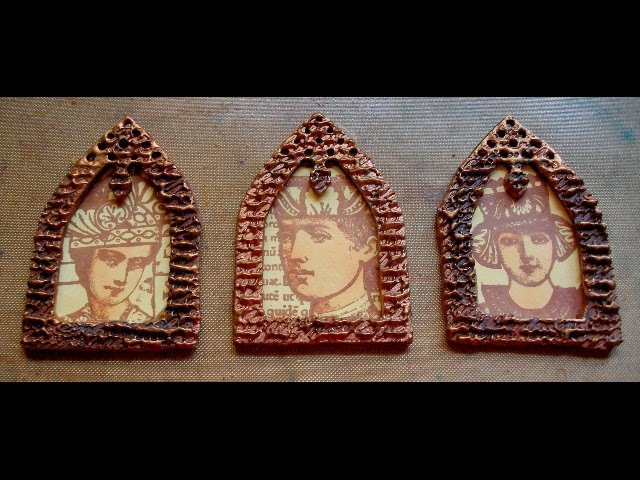 All links go in the draw to win a voucher to spend on products of your choice from the PaperArtsy online store. 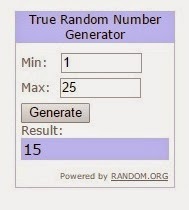 The Niches link will close 17:00 (London Time) Sunday, April 26th, winner will be announced 2 hours later at 19:00. To finish the tree scene, stamp and paint lots of owls and birds, plus a couple of semi circular nests to make the sun. In addition to the paints already used, I chose Haystack, Butternut and Purple Rain. 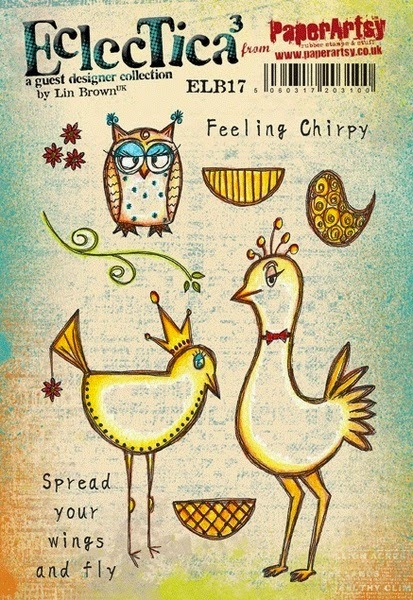 I love these bird stamps from ELB17 - they've got such wonderful expressions! 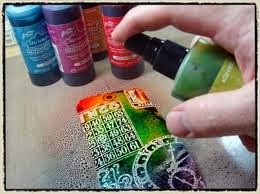 By colouring them with the Frescos you can get great shading by diluting them with water. I've enjoyed making my niche and by using dies, you can create different shaped apertures to fit your theme. So find an old book, get out your dies and have a go! Wow, Helen this is fabulous. What a truly brilliant idea, and that texture is so effective. Well done for being brave and experimenting with the book/dies in your machine. I can see lots of people trying this one. 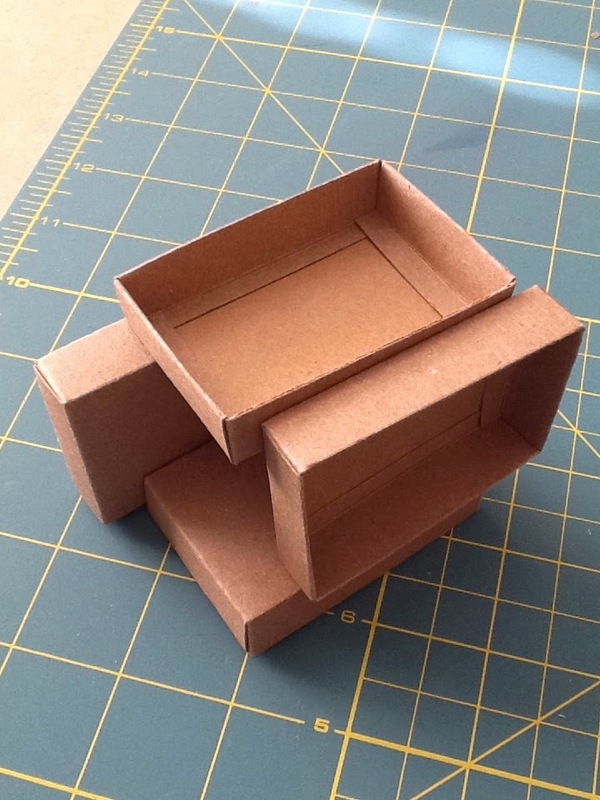 Hi everyone Penny here, joining you this evening with a post about creating niches. Obviously I had to sign up for this one.......it has to be 3-D, it has to have texture and it made me go all...well....archaeological! It happens sometimes! I don't know why but I just keep getting drawn back to rocks. I started this project with a small pile of them and it grew from there. Heavy gel medium sticks everything! I roughly brushed more heavy gel over the boxes and sprinkled rough sand all over. 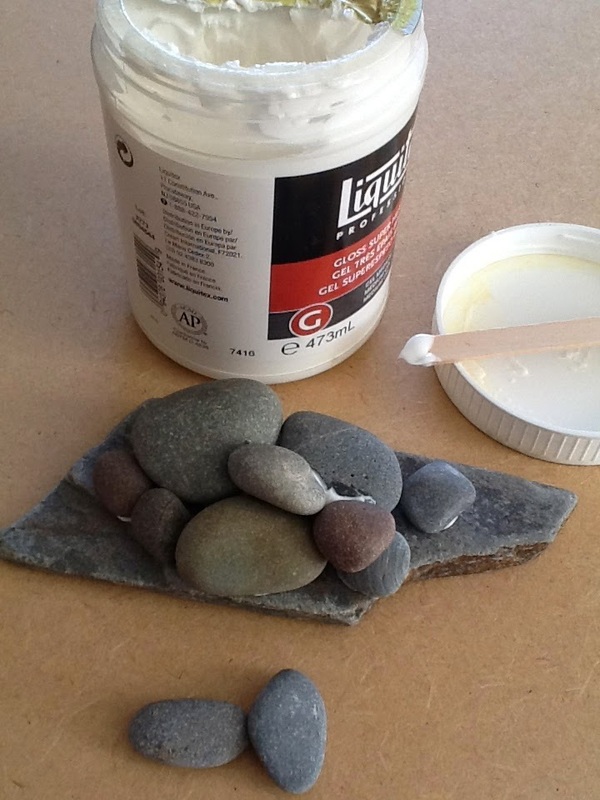 When dry, paint all over with Slate Fresco Finish Acylic Paint and dry brush with areas of Chalk, Blueberry and Brown Shed to echo the colours of the base rocks. Glue the niches to the rock pile. 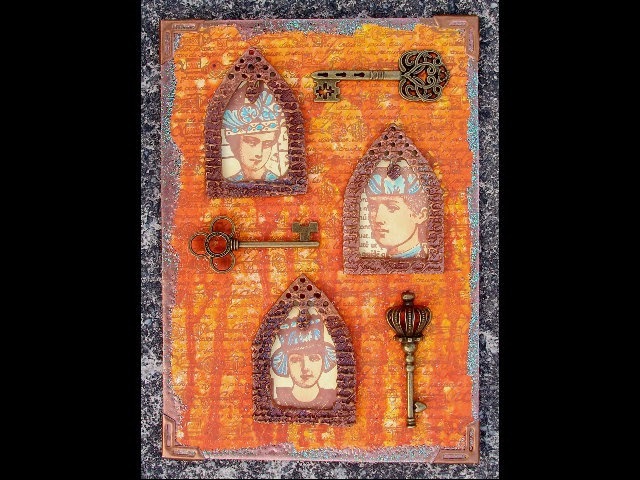 Stamp images from Lynne Perrella's new collection LPC033 on Kraft card and colour using gel pens or Fresco Paint. 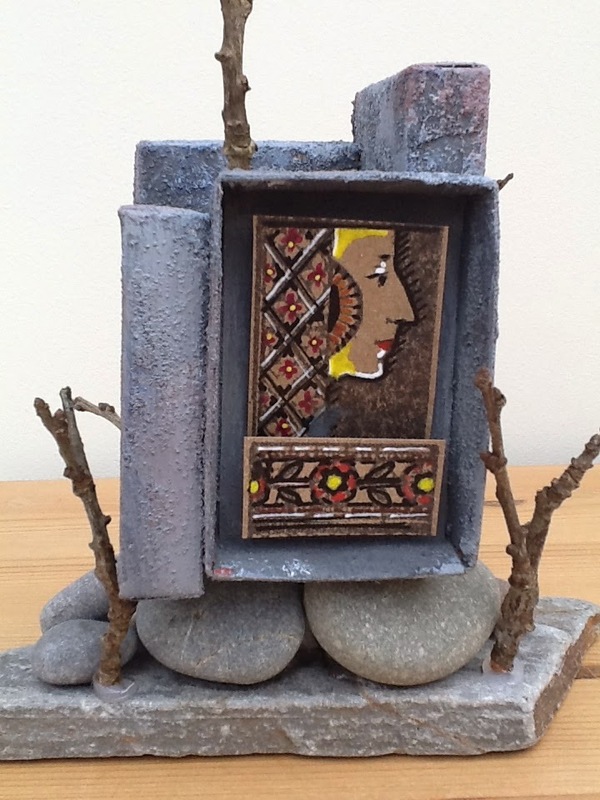 Cut into niche-sized sections and use foam adhesive pads to give dimension to the images in their natural rock frames. I really like this wind blasted, primeval, less is more look. You could have as many niches as you wanted in your construction (and as many rocks!). Wonderful piece of 3d/abstract art Penny. The natural elements incorporating the pebbles/twigs have created a great a tiered visual for your niches. The LP images fit perfectly with this project. Thank you for sharing your creativity.